The weekend of June 3, 18 photographers made it for all or part of the weekend in Goliad. Thanks to Alan M. for arranging this and to our guides, Steve and Carolyn, who did a wonderful job of showing us city slickers around the area. We rendezvoused at the Goliad Best Western Hotel on Friday and went out to make pictures at the Presidio La Bahia. After dinner (and perhaps a few drinks) at the Empresario, we headed back out for sunset at the Goliad State Park & Mission Espiritu Santo State Historic Site. The next morning we were out before sunrise at Presidio La Bahia. We then headed to the town square for a photography opportunity before heading back to the hotel for breakfast. Afterwards we walked the grounds of Mission Espiritu Santo and drove around the park where there were about 200 cliff swallow nests under the 183 bridge. Back to Presidio La Bahia for inside the grounds and chapel. We also photographed the grave of Col. Fannin and his men with the Angel of Goliad statue. Lunch was on the square at the Blue Quail with some great soup and sandwiches. We agreed to meet later that afternoon for dinner. In the interim, many of us somehow found our way to the beer garden at the Goliad Brewery for a tour, live music and drinks. Dinner was at La Bahia and then back to Goliad State Park for the golden hour. Sunday morning was relaxing as we had breakfast and headed out. On our way home, we made a couple of stops including the Fannin Battleground. Great times, conversation and I am always picking up photography tips and pointers from so many with a wealth of experience. Presidio de Nuestra Senora de Loreto de la Bahia (Fort of Our Lady of Loreto of the Bay) was re-established at its current location in 1749 to protect Espiritu Santo Mission, which was also relocated in 1749 .25 mile to the NW. Presidio La Bahia was under a number of different flags during its history, which is why the nine flags fly outside its entrance. Ninety-two Texan citizens and soldiers drew up and signed Texas’ first formal Declaration of Independence on December 20, 1835 at Presidio La Bahia. In the ensuing war for Texas independence, Col. James Fannin retreated from Presidio La Bahia upon orders from Gen. Sam Houston (though he should have left sooner as he was ordered to do). On March 19, General Urrea had quickly advanced and surrounded the Texian Army on the open prairie about nine miles from Goliad. The two-day Battle of Coleto ensued, with the Texians holding their own on the first day. However, the Mexicans received overwhelming reinforcements and heavy artillery. Fannin and the majority of the men voted to surrender the Texian forces on March 20. Led to believe that they would be released into the United States, they were marched back to Presidio La Bahia, now their prison. Outside the Presidio La Bahia stands the Angel of Goliad statue and the Fannin Monument. 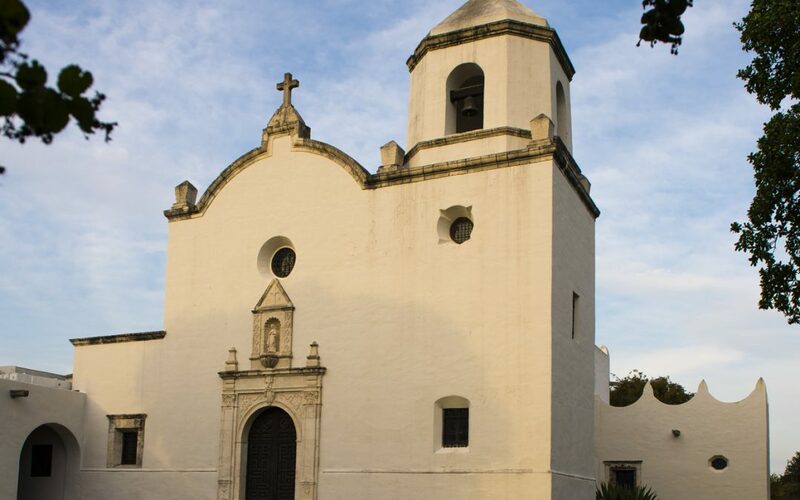 Francisca Alvarez was traveling with the Mexican army at Goliad and the night before the massacre hid a few Texians and pled for the lives of others on Palm Sunday. She continued tending to others. After the executions, the Texians’ bodies were piled and burned. Their charred remains were left in the open, unburied and exposed to vultures and coyotes. General Thomas J. Rusk found the remains of the massacre victims in June 1836 and gave orders for a formal military funeral. The remains were interred at the location southeast of the Presidio La Bahia where the Fannin Monument now stands. The whereabouts of the gravesite was forgotten until years later when human bone fragments were discovered by a group of Boy Scouts. In 1938 the monument to Fannin and his men was erected at the site of the mass grave inscribed with the names of the massacred. Below are the labels for General Zaragoza Mexican lager beer at the Goliad Brewery, which had a beer garden on Saturday. General Zaragoza was born on the grounds of Presidio La Bahia in 1829 and led the Mexican army that defeated invading French forces at the Battle of Puebla on May 5, 1862, which is celebrated as Cinco de Mayo. Thanks, Jan for pointing out this shot angle.